You could drive the 101 for years and never realize they were here: The Edna Valley and the contiguous Arroyo Grande Valley to the south qualify as the Central Coast’s stealth wine region. To find the Edna Valley, look for Price Canyon Road, which leaves the freeway and winds into the coastal hills, following Pismo Creek. A few miles past the pump jacks at an oil production facility, the road leads into the valley, where farms, ranches, and vineyards stretch to the base of the Santa Lucia Range. With the open terrain working as a conduit for the ocean air, Edna Valley is considered California’s coolest region—and prime country for pinot noir and chardonnay. For some perspective, head over to Edna Valley Vineyard. You may hear grumbling around the county about Gallo’s 2011 purchase of the winery, but the tasting room, renovated last year with floor-to-ceiling windows, opens to a panorma of the wide, flat valley, with cone-shaped Islay Hill and Bishop Peak in the distance. They’re two of the Nine Sisters, the volcanic chain that includes Morro Rock on the coast. 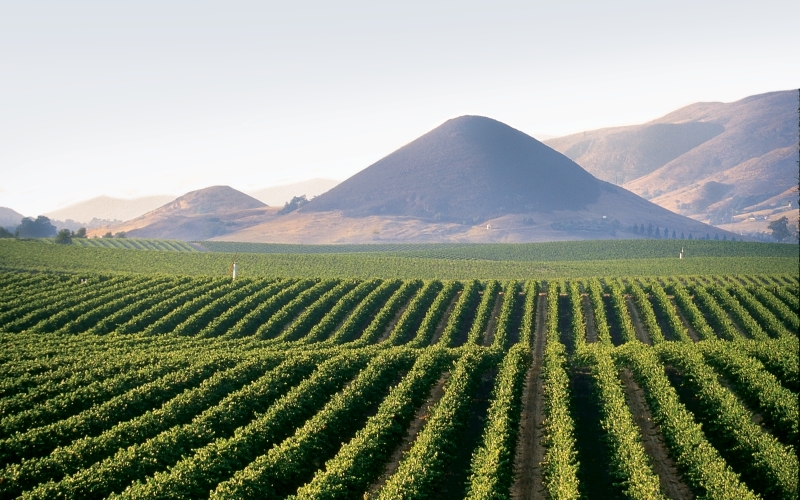 The Arroyo Grande Valley has its own marine influences but also areas with bigger daily temperature swings suited to cabernet sauvignon, zinfandel, and syrah. At Saucelito Canyon Vineyard in the Arroyo Grande Valley, zinfandel vines were planted in the 1880s, surviving Prohibition and then decades of neglect. In the 1970s Saucelito Canyon’s Bill Greenough restored the vines, which had been overgrown by dense chaparral. Nearly 140 years since bearing their first grapes, these vines continue to produce, starring in the winery’s estate zins. An easy side trip from the vineyards, Taste! lets you pair items like banh mi sliders with bacon-topped feta mac-and-cheese from its comfort-steeped menu. In town, the Station hosts special events with leading small-production winemakers in a beautifully converted Art Deco gas station, while SLO’s most stylish lodgings are at the Granada Hotel & Bistro ($279-$499), where the square footage is tight but the brick walls and Euro atmosphere make up for it. There’s plenty of action in this vintage beach town, especially around the pier, which is in the midst of a rehab. Just opened, the 104-room Inn at the Pier ($159-$489) brings a contemporary beach-cottage feel and touch of luxury to the heart of Pismo. Three blocks away, Ash Mehta and Lissa Hallberg can walk you through the encyclopedic collection of Central Coast producers at their wine bar Tastes of the Valleys. Five minutes up the road, Shell Beach’s gourmet deli DePalo & Sons has what you need for winery or beach picnics. If coastal towns tend to be more about cervezas than syrahs, Avila Beach is the exception, with no fewer than five tasting rooms a block from the sand. You can kayak among the sea otters and sea lions on an outing with Avila Beach Paddlesports, and for some history, book a trolley or hiking tour that visits the 1890 Point San Luis Lighthouse. Then pair the bay views of Mersea’s on Harford Pier with some crab cakes before calling it a day at Avila La Fonda ($197-$839). With its rolling vistas and (relatively) quiet roads, San Luis Obispo wine country is ideal road cycling terroir. You can download maps from Bike SLO County for a pair of routes leading to wineries in the Edna and Arroyo Grande valleys: One is a mostly flat 20-mile ride; the other, a 30-mile loop with some climbing. Take it slow on the tasting, though, and save your legs for the ride back, when the afternoon onshore winds kick up. For a less DIY experience, Central Coast Outdoors leads half-and full-day tours both into Edna Valley and around Paso Robles that include lunch and wine tasting. Previous articleIn the War Over Waze, Will Rich Angelenos Demand Private Streets?